What values drive and inspire those goals? Why would an employer want to hire YOU? 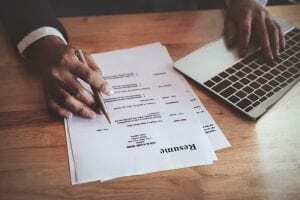 The bottom line is that you need to carefully craft your resume and avoid common resume mistakes to have a fighting chance. Avoid using colored paper, flashy icons or graphics. Yes, you want your resume to stand out from the others, but those are not the ways to do it. In terms of fonts, don’t use unconventional fonts. Stay away from Times New Roman, which is passé. Don’t focus on job responsibilities. Instead, show the results of your work. Fluff is not what you want on your resume. Hiring managers spend very little time looking at a resume – sometimes as little as 30 seconds – so you don’t want it bogged down with nonessential information. 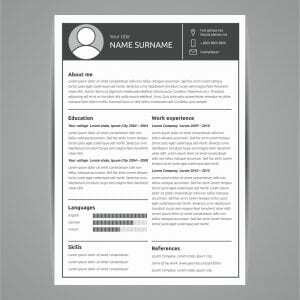 If you try to be gimmicky with the way you present your information to make your resume truly unique, it could very easily backfire. Shy away from listing weird email addresses, nicknames or questionable achievements that would deter from a professional appearance. Never add your photo, no matter how good you look! Don’t list jobs that are irrelevant to the job you’re applying for unless you are just out of school and have a limited job history. If you’re apply for a job in which you will be using computers, don’t list Microsoft Office as a skill; it is a given that you will know how to use it. Do not include an objective on your resume; that is so 1999. Tailor your resume for each job you’re applying for, focusing on skills and phrases from the job posting. Beat the bots that scan for keywords and eliminate the bulk of candidates before they even get the chance of an interview. If you’re not sure which keywords to look for, a free word cloud app can help you out. Select and include the roles you’ve had that are most relevant to the job you’re applying for – especially if you’ve had a lengthy work history. Devote time to the skills section of your resume and consider listing them in two or three columns as opposed to a paragraph or single column. If you’re not sure what to include, take a look at your LinkedIn profile (which should also be updated and in good shape). Add an optional summary that highlights the best of your skills and achievements. Use the job listing to guide you as you create your resume. Show your most recent job on top. Showcase your achievements with figures – percentages, dollar savings, etc. – whenever possible. Most importantly: proofread your resume carefully for typos, misspellings and other errors. If you can, have someone else look it over for errors and general flow of information. Resume formatting is best when there is a balance of paragraphs and bullet points that fit on a maximum of two pages. Keep it simple, contemporary and relevant to your desired job. Calibri, Arial, Helvetica and Tahoma are all great fonts to use for your resume. When you’re writing your resume, focus more on what you can do for your next employer rather than what you’ve done in the past. Although you will still need to sell yourself in an interview, a strong resume can get you in the door. Once you graduate, Coyne’s Career Services staff can help you find a job and reach your career goals. They will help you complete job applications, prepare custom-designed resumes and resume writing, learn successful interview techniques, research prospective employers, write cover letters and thank you notes, and more. This service does not end with your first job; Coyne’s Career Placement Services provides lifetime assistance. Contact Coyne College in Chicago today and learn more about training for an in-demand career.